Lawn Care: We’ll keep your lawn looking clean and healthy with professional services including mowing, edging, blowing and cleaning. Mowing: We use professional power equipment, including mowers that have frequent blade replacements to keep a clean, fresh cut every time. Edging: We edge your lawn to keep a sharp defined look to define your grass from pavement and other edging. Blowing: We blow clean all paved areas, beds and grass, giving you property the professional clean appearance you expect. 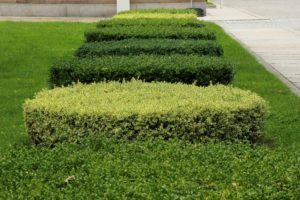 Hedge & Shrub Trimming: We’ll keep your hedges, shrubs and small trees at the appropriate size by trimming at the correct times of the year. Regular trimming and tree pruning is important to their health. Seasonal Clean-Ups: When it’s that time of year again, we are here for your landscape cleaning needs. Leaf removal, leaf mulching, trimming, pruning, gutter cleaning and weeding are all services we offer. We’ll have your lawn landscape looking new again! 1. Water less but for longer periods. This will promote deep root growth and contribute to a healthier and hardier lawn. The roots are forced to grow deeper to take in water, so during droughts or harsh conditions the grass can withstand much more. 2. Fertilizing once per quarter with the right fertilizer should be adequate. Don’t over do it with those harsh synthetic fertilizers that can turn your soil into unwanted hard-pan. It’s best to have a soil test done and treat the lawn & soil with the right amounts of nutrients to keep the soil ph balanced. A healthy soil is the base to all healthy lawns and landscapes. 3. Mow often enough that your only cutting a third of the grass height. Waiting too long to mow and cutting more than a third can lead to a struggling lawn.